Tinotenda Kadewere was emotional when he bade farewell to Djurgårdens IF following his move to the French Ligue 2 side Le Havre AC. The Swedish side confirmed the 22-year old’s transfer on Friday. Kadewere first arrived at Djurgårdens in August 2015 on loan from Harare City before completing a permanent move six months later. His first season at the club was dampened by injuries and only made an impact the following year. The Zimbabwe international has also enjoyed a great start to the 2018 Swedish campaign, scoring eight times in twelve starts. This form attracted interest from the French side despite another recent injury set back. 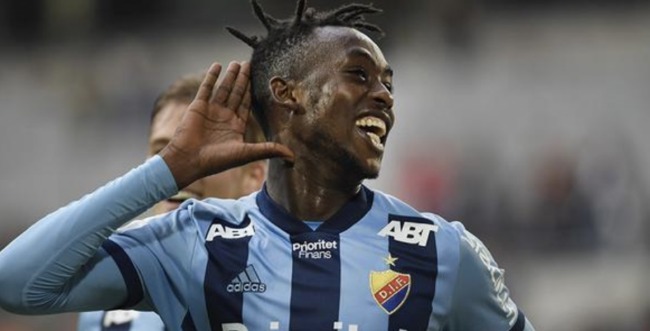 Speaking to the club’s media, Kadewere said: “It’s good news for me as a footballer to make another step, but it’s also bad news because I don’t know how I will live in France without all these Djurgården people. Kadewere also recalled the time he arrived in Sweden, saying he was different from what he is today. “Djurgården raised me to be someone else. I had so much love from the fans and the team.